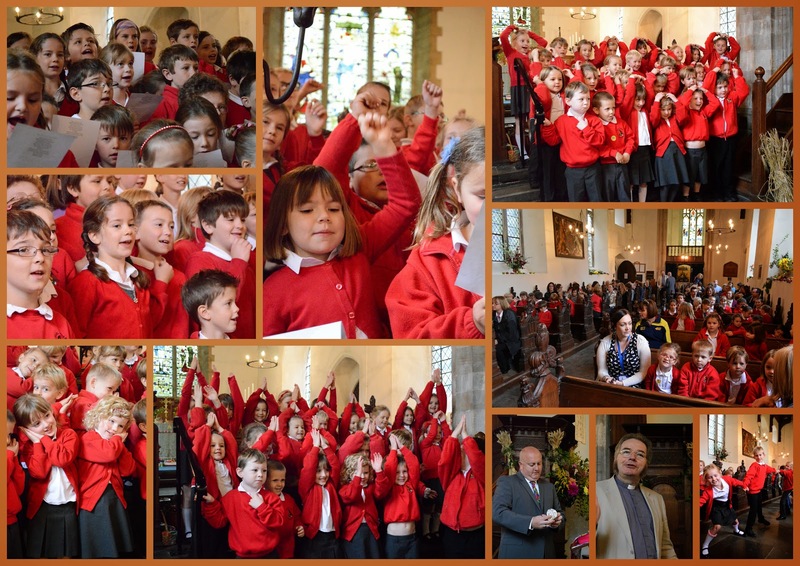 This morning saw the whole school troop over to the church for our Harvest Festival celebrations. The many gifts of food brought into school had been placed in the chancel and the church had been decorated beautifully with examples of our county's bounty. The children listened well as Mr Pearce talked about the importance of food to everyone, people and animals alike, and the many varieties of food available around the world. And even the distraction of a robin flying between roof struts did not disturb their concentration as they heard Reverend Brian talk about eyes of potatoes, ears of corn, heads of celery, hands of bananas and artichoke hearts and the way that each of these foods reminds us of our responsibilities to others and the importance of loving one another. Each class sung a harvest song. Orange Class gave a heart-warming rendition of Cauliflowers Fluffy, complete with actions and Green Class reminded the congregation that teamwork was the key to success in The Enormous Turnip Song. Finally, everyone sang together a rousing performance of Food, Glorious Food from Oliver.